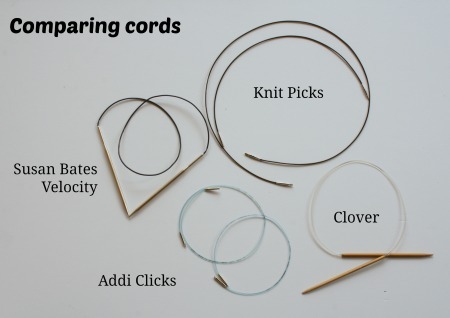 A review of Knit Picks Options interchangeable needles. I’ve spent the past few weeks playing with my new knitting needles from Knit Picks. As part of my last order from Knit Picks, I got a Try It Needle Set. * That is the length you get when the tips are attached not of the cable itself. The tips are as good as some and better than most of the other needles in my stash. The cables are the best I’ve ever tried. Love these cables. I wish I could pass them through the screen so you could try them for yourself. The Try It Set is a mini set of interchangeable needles. Its a nice way to start building a set if you’re just starting, to find out if you like nickel plated or wooden tips best, and to get a feel for the quality of Knit Picks needles before you commit and buy a big set. Those big sets are a commitment. The Try It Set let’s you dip your toes into the water and that’s nice. When you get a Try It Set you get to choose the colorway of the wooden tips. 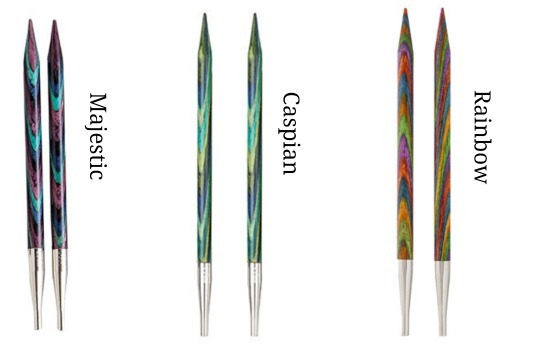 Knit Picks offers 3 multi-color wooden needles. I got the Majestic tips. Its the newest color and I hadn’t seen them in person. But they are all pretty and I don’t think I could pick a favorite. Knit Picks uses a screw together join to connect the tips to the cables. Knit Picks interchangeable needles and how they join. When I first got this needle set, I took them to weekly sit-n-stitch group and passed them around. There was a lively discussion (you can rely on sit-n-stitch groups to get excited about your new needles when no one else will) and I listened. One lady said “oh those will unscrew as you knit” and another said “not if you use the tightening key”. So I conducted a little test as I knit up my Chromotism. I tightened the joins but only by hand and started knitting. After a dozen rows the needles began to unscrew. I tightened up, again by hand, and kept going. Again they began to unscrew. So I used the tightening key. The tips never came loose again. You have to use that tightening key when you screw on the needle tips. If you do, you won’t have any trouble. These tips are light weight, very smooth, and about 4.75 inches (12 cm) long. That makes them long enough to fit most knitters’ hands. I mention the length of the tips because I own a set of Addi Lace Short Tips and they don’t. The Addi Shorts fit my hands okay (I have small hands) but other knitters have tried them and didn’t like them at all. I’ve had two put those Addi’s down with a firm “no, those won’t work at all”. So I’ve recently become more aware of the length on interchangeable tips and the ones from Knit Picks are long enough for nearly everyone. The nickel plated points are sharp enough for lace. In fact as soon as I started working with them I thought “these seem to be just like my Addi Lace tips”. That’s because they are. 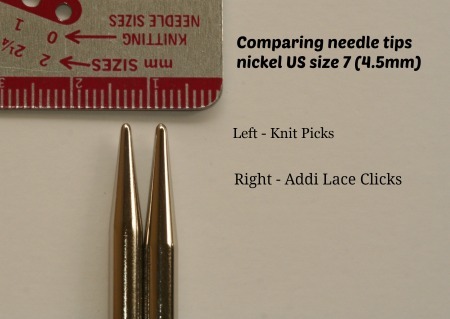 The points on the Knit Picks nickel plated tips are virtually identical to my highest quality lace tips. And that surprised me because those Addi Lace tips are kind of pricey (but more on cost comparison later). The Knit Picks wooden tips are virtually the same as my tips from Knitters Pride and a definite improvement over my Clover tips. Ahh these cables are great. They are nice and flexible, which is what every knitter wants. They meet up with the metal at each end seamlessly so they don’t snag your active stitches. But best of all, they don’t have that dratted coil in them. What I’m trying to show here is that the Knit Picks cables don’t loop; they don’t try to form a circle. They have the smallest amount of curve and spring in them of all my circular knitting needles. 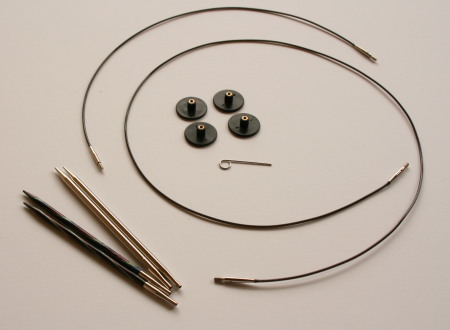 You know how all too often you feel like you are fighting the spring in your circular needle? Well I don’t feel any of that with these Knit Picks. They may not look as pretty as the clear gel-like cables that some of my other needles have but they are easier to knit with. I wish you could feel them for yourself and see how they bend and flex and then straighten. So nice. The Try It Set, the mini set that I’m showing here, is $14.99. With two sets of tips and two cables that effectively gives you four different circular needles which is a very good deal. In conclusion (which I hate writing) Knit Picks makes very nice interchangeable sets. The quality is good, right up there with name brands that get lots of respect. I think any knitter would be well pleased with either the nickel plated or wooden set. 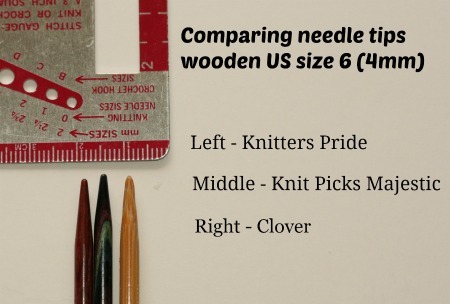 When you compare the prices of a Knit Picks set to others of similar quality, you’ll find Knit Picks offers knitters a better deal. Hands down a Knit Picks needle set is the smart buy and I happily recommend it to anyone in that market. Now I’m going to go back to knitting up my Crown of Glory lace shawlette thingy on my Knit Picks Majestic needles. I feel I have to keep testing these babies out for you. I’m a total professional like that. 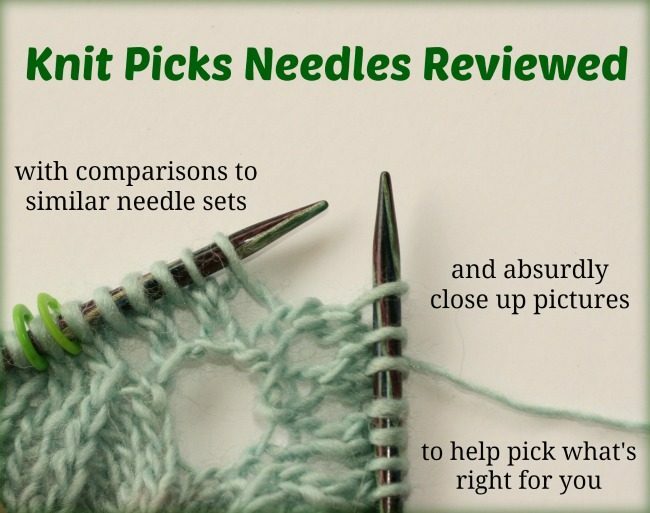 43 Comments on "Trying the Knit Picks Needles – a review"
Ahh.. Well let me know what you think of them when you do. Hope you like yours as much as I like mine. I actually got rid of my Knit Picks nickel plated interchangeables and switched out for HiyaHiya (for which I paid a fair amount less than the price you have listed). I find the stainless steel to be just a smooth and not overly slick, and in the metal at least, the KP needles are a lot heavier than the HH needles. It’s a good thing we have lots of choices in knitting tools, isn’t it? I discovered knitpicks years ago, love the variety of tips. I use the nickel when I want the sts to slide easily and the great colors of the wooden needles are fun- I have some in each color. Also a good customer service dept. I had a needle that came apart at the join and they replaced it without a question. Only happened once and I have used these needles a LOT. I would recommend them, great value for money! Awesome. I too love the colored wooden tips. They make me happy just looking at them. Its a bit like writing with a fancy pen for the day as a way to cheer myself up. Am I the only one who does that? Because with these color needles I can do it in knitting now too. I’m VERY happy to hear about the unquestioned return. My personal experience with Knit picks customer service has been very positive as well. Knit Picks customer service is amazingly! I mentioned in an email that I had a defective needle and they sent a replacement. I gave a negative review on a yarn ball winder that was defective. In the review I stated that I had not been able to return the ball winder because we were moving, then it was months until I unpacked it to sell at a garage sale. Knit Picks gave me a credit for $19.99! Not even LL Bean’s return policy is that good! That is great to hear. Knit Picks has always treated me well and all of my friends and students. One of the best reviews and comparison of sets I’ve seen. Very helpful especially the comparison pics. You’ve sold me on trying them next time I invest in some new needles. Oh wonderful! 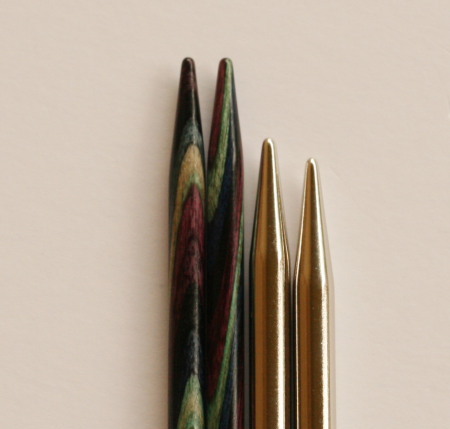 I am enough of a geek that I enjoy detailed scientific-level pictures of things like knitting needles. But I’m not sure they have wide appeal lol. So I’m glad to hear that they helped.